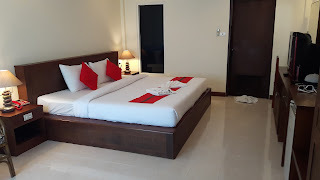 Checkout this video, I have shared few glimpses of " Andaman Seaside Resort", a is a beautiful 3 star property located just 100 meters away from the beautiful Bangtao Beach. It is one of the most popular resorts in the area because of its cheap price, excellent facilities and close proximity to the Phuket International Airport. It is near to many popular tourist attractions and the hotel staff can help guests with arrangements. ★Under the Hotel's premises you can find Thai & Indian Restaurants, Massage Parlor, 7/Eleven, Currency Exchange facilities etc. Tourist attractions includes Laguna (Bangtao) Beach, Phuket Zoo, Phuket Fanta Sea, Simon Cabarets, Jungcylon Shopping and water show. or Email at : andamanseasidepk@gmail.com and show them the link of this video or this post instead.